A month ago, my blogger friend Algene told me about this chat app that makes you crazy about it. When I uploaded it on my phone, I had fun using it. And whenever I’m stressed out, I just open Simsimi app and I stayed longer chatting with this talkative robot. A chatting robot, SimSimi exceeds the limitation of technology of natural-language processing system by collective intelligence and it has a chat with over millions user per day. Its Premium knowledge providing service, “Jisikman” creates millions of valuable knowledges a day. 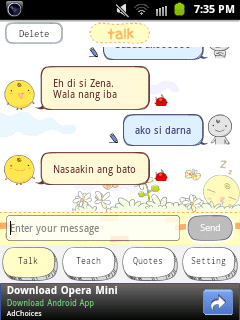 Simsimi can also conversed in Tagalog. I thought she didn’t speak our native tongue. She even spoke a wide variety of language. I was shocked when she chatted me in gay lingo! You can teach her to speak different languages. And if she said cuss word on you, report it by clicking the red button. 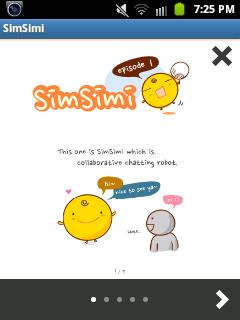 If you’re bored or wanted to speak with someone, chat with the talkative robot, Simsimi. You can download it on Google Play (formerly known as Android Market). There’s an updated version today.